A Sri Lankan Boro-budur lost for ever? In the article published in the Daily News of July 23rd 2002, Rohan L. Jayatilake questions the rendering of Kantarodai as Kadurugoda but offers no alternative. I agree on the absence of a linguistic relationship between the two versions - the Sinhala version should be Katuroda and the place mentioned in the Nampota as Kadurugoda should be sought elsewhere - but the question is not one of the Sinhalese name deriving itself from the Tamil word but vice versa, as is the case with other places in the peninsula. Even in the 15th century just before the arrival of the Portuguese, the North was still a land of the Sinhalese Buddhists after Sapumal Kumarayas 17 year rule there. For example, the Kokila Sandesaya which describes several places on the route to Jaffna in detail, mentions the huge Natha Devale [Avalokitesvara Bodhisattva worship] at present day Chavakachcheri, which John Clifford Holt in his intensive study on Avalokitesvara worship concludes, was the result of Javanese Buddhist occupation of these parts from the time of Chandrabhanus invasion and that even by the 15th century this influence was very much in evidence. Holt excludes the possibility of the Natha Devale there having been the work of non-Buddhist Ariya Cakravarttis. Even though there is evidence in Yalpana Vaipava Malai that alien Ariya Chakravartti rulers suppressed the Buddhist in the peninsula, they had to continuously contend with a Buddhist Sinhalese majority who were raising revolt against them with the support of Vanniyas. Since the Vanniyas were installed by the Sinhalese king with Suriya Damana of the Ariya Vamsa family as the first to be assigned to the Jaffna Peninsula [see Royal Asiatic Society Journal, Sp. No 1996] they continued to show their allegiance to the Sinhalese. For example, when the Dutch prepared land Tomboes the Jaffna Vanniyas who claimed these lands by virtue of grants by the Sinhalese king protested and left the peninsula avowing not to return except with a Sinhalese army, which shows how close the relations between the Vanniyas and the Sinhalese were as against that with alien Ariyacakravarttis who were maintained in power by the Tanjore army. These are recorded facts of history. In the early part of the last century when Sir Paul E. Pieris examined some of the ruins of the former Buddhist places of worship they were still being progressively obliterated but they were identifiable from what remained as well as from some of the place names. As he observed, several cart-loads of bricks were removed from Putur Kovil Adi [Buddha temple] in the village of Puloli near Point Pedro for a building in the adjoining land! Many images had been destroyed beyond recognition. If the people in the North-East were Buddhists earlier as it is claimed, why was this destruction of their own former cultural heritage? Is there no lesson to learn from Indonesia, Bangladesh, and Maldives in our region where these non-Buddhist countries have endeavoured to preserve and present their Buddhist past to the world, if not for anything but for its economic implications? [There may be a point in the claim that the people were Buddhists earlier because they were Sinhalese, later Tamilised when they were turned into landless slaves and serfs depending on the largesse of Vellalas who migrated to the peninsula in Dutch times during the tobacco boom]. The conclusions of the Tamil historian Dr. Kartigesu Indrapala with the evidence of place names, also go to show that it was not with the Jaffna peninsula that the South Indians had first contacts but with the North Western coast. He showed by the way place names in the Jaffna peninsula had been transformed into Tamil that Jaffna peninsula was Tamilised in more recent times and the places had still not shed their original Sinhalese identity. This is what many Tamils knew and told us before more recent problems arose and a claim of Tamil homelands was made. Now from letters I receive in the fan-mail even Buddhist places in the south like Mihintale and others are claimed to be derived from Tamil! These are, of course, made without any historical foundation. Contrary to what Jaytilake says, even under the long Cola occupation in the 11th century Jaffna does not appear to have occupied an important place in their administrative province [Nadu] to which the island had been reduced. Remnants of Cola influence are seen not in the peninsulas but elsewhere, especially, at Polonnaruva where Shiva temples, Hindu bronze sculptures and a few Tamil lithic records have been discovered. Surprisingly Tamil inscriptions are so rare in the whole island compared to the nearly a century old Cola occupation and the conversion of the island into a province [nadu] of their empire. How is it that there are no Tamil inscriptions in the Jaffna peninsula except the one in the Jaffna Fort which refers to the reign of Rajendra Cola which has been transported from another place, and another in Hammenheil in Kayts which has been brought from Mantai. [Epigrahia Tamilica, Vol. I, Part 1, 1972. ]; and the fragments of four inscriptions which had been deliberately damaged and used in Hindu kovils or were in private property. [Paul E. Pieris]. This is surprising considering that Jaffna peninsula is claimed to be the centre of Tamil culture. The writer has quoted extensively from Dr. S. Paranavitanas interlinear inscriptions." Even if one may leave out details there are some valid inferences that could be drawn from the latters reasoning. That is that the Kantarodai remains may not be simple burial monuments of remains of leading Buddhist monks but could point to a link with concepts of stupas which were developed in Central Java and other places in the Malay archipelago. That means it was a centre where Vajrayana was practiced as at Boro-budur. One cannot escape observing, even with a simple look at pictures, the similarity of the cluster of small stupas at Kantarodai [8 1/2 to 12 ft. in diameter] with a larger stupa [24 ft. diameter] in the centre with those on the three terraces at Borobudur surrounding the larger central stupa, each of which contained an image of the Buddha. [Vairocana/Aksshobhaya]. What is questionable is Paranavitanas account of a "Minister of Yavadvipa" building Kantarodai but not the essence, i.e. the direction of his intuition arising from his unparalleled knowledge. He should have followed up with a scientific comparison of the remains of the two places but that stage seemed to have passed when he wrote basing his material, perhaps, on a fiction of his imagination. Any way, his was the only attempt to explain the Kantarodai Buddhist remains. The remains at Kantarodai which included not only the series of stupas but also badly destroyed Buddha and Bodhisttva images and a Stone with the Buddha-pada [remember Manimekhalai?] need to be scientifically interpreted. To assist in this task we have a vast resource of knowledge on parallel monuments in other parts of the world for comparison and also a wealth of Mahayanic and Vajrayanic Buddhist lore to look for the source of inspiration for these monuments. Contemporaneously with Boro-budur, which was constructed by them in that century, similar Vajrayana inspired centres existed in Bengal where Tantric Buddhism prospered under the Pala kings, and also in Tibet and Nepal. Vajrabodhi, the first Guru of the Yogacarya school of Nalanda stopped in Sri Vijaya for five months waiting for right winds to proceed to China to introduce Tantrism and he returned in 742 A.D. from Canton on a Malay ship. That was the year that Sri Vijaya had ceased to send missions to China and when Sailendras of Central Java, who were the creators of Boro-budur, became the dominant power in the Malacca straits. One also notes that the powerful Sailendra rulers of central Java had close contacts with the Pala rulers of Bengal around the 8th century. Balaputra, a grandson of Sailendra ruler of Yava-bhumi [who had moved to Chan-pei (Jambi) in Sumatra] had built a temple for his people who went to Nalanda for study and the Pala king donated five villages for the upkeep of the temple. The above evidence shows how close the relations of the Sailendras were, with the Pala kings of Bengal and the monastery at Nalanda with the prospects of that great Buddhist University having been a source of inspiration for central Javanese Buddhist enterprise. That influence could not have escaped Sri Lanka particularly considering that the Sailendras are believed to be by some scholars of having been of South Indian origin. Archaeological evidence from Tiriyaya-Kuchchivele-Anuradhapura triangle confirms the influence of Tantric Buddhism. Prof.[Em] Dr.Ceaser Voute, is conducting research to understand if the world famous central Javanese monument Boro-budur, for the restoration of which he was a UNESCO consultant, received its inspiration from Sri Lanka. His bold assertion that Gunadharma to whom the local tradition of Central Java ascribes the building of Boro-budur compolex, was a resident at Abhayagiri Vihara and that he played an important role in the design and construction of Boro-budur itself is a pointer to the direction of present inquiries. Circumstantial evidence is very strong that the builder of Boro-budur whether it was Gunadharma or not, had been fully versed with Mahayana and Tantric beliefs and concepts and had been a person with a fertile imagination. Dr. Voutes inquiry is particularly to see if a link could be established between Boro-budur on one hand, and Abhayagiriya and Buduruvagala on the other hand, the latter in regard to the name and the Vajrayana inspired concepts and themes of sculptures, though found only to a limited extent in Sri Lanka. [See Sunday Island, March,31, 2002]. These inquiries add some weight to Dr. Paranavitanas intuition enveloped in the form of interpretation of interlinear inscriptions. Much remains to be done in respect of the progress of Buddhism and its institutions in Sri Lanka. Only the tip of the iceberg has been touched under the parameters drawn by the Mahavira much by way of ignoring the role of Mahayana and Tantrism had played. In this essay we merely take note of the close association that kingdoms in the Malay Archipelago maintained with other Buddhist Kingdoms in the region of the Bay of Bengal including Sri Lanka and there is some substance in what Dr. Paranavitana says, though the detils of his version is rejected. In 1913, Dr. Paul E. Pieris discovered a cluster of small stupas in at Kantarodai. Many of these are now in ruin according to the recent news report. Yet the view of a few of the stupas are clear enough to enable an assessment. The first thing that struck me was their close similarity to the stupas in the three upper terraces at Boro-budur with an Adi-Buddha attached to each stupa. 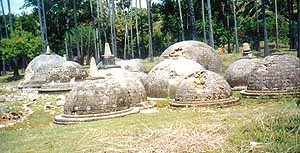 *Actually, there are 72 such stupas placed in concentric circles at Boro-budur with an additional larger stupa in the centre forming a Mandala. The 72 stupas have latticed domes through which the Buddhas placed inside each could be seen. The central stupa has a hollow pit where a Buddha image, identified as that of Aksobhaya was placed, while the 72 images attachded to the other stupas had been identified as variations of Vairocana Adi-Buddhas. [Adrian Snodgrass: Symbolism of the Stupa]. The discovery of what is believed to be the ground plan of a lotus shaped stupa among Abhayagiriya finds, claimed as that of Boro-budur, somewhat hastily as I think, has given much encouragement to scholars to look for the link wiht Boro-budur in Sri Lanka. Dr. Sondgrass explains the significance of the use of the figure 72/73 arranged in the Diamond World Mandala formation, but the number could differ from 62 to 81. At Boro-budur he explains that there are 37 Honoured ones of the Diamond World Mandala, the 37 aspects of Total Knowledge. It may be argued that all stupas as they evolved, whether they be Manushi Buddha stupas as in Sri Lanka, Myanmar and other places; or whether they be Adi-Buddha stupas as at Boro-budur, Tibet and Nepal, followed the Mandala principle, but in Sri Lanka the Mandala is not exhibited in external dimensions as in the latter group. The stupas discovered at Kantarodai may not represent the total number in the original complex. [The number has not been precisely recorded and the site is more extensive than the three acres recovered]. It is probable that they formed a Mandala of 62 stupas if not of 72 or 81. The evidence is that even after the discovery some have disappeared. Dr. Paul E. Peiris effort with an outlay of Rs. 100/= is creditable and Dr. C. Godakumburas contribution to declare three acres as archaeological reserve and carry out some excavations are noteworthy but the history of the complex still awaits scientific interpretation. In the light of evidence we have on Vajrayana inspired stupas and images in central Java and elsewhere the stupas at Kantarodai with their obvious similarity to them cannot be dismissed as mere burial stupas of prominent monks in the island. In that light the date given to the stupas also may need revision if evidence reveals that the edifices are Vajrayana inspired. The punch-marked coins, the Lakshmi types and debased Roman coins found at the site certainly belong to an earlier strata than 8th century A.D., pobably when Vajrayana made its impact in South East Asia and had an impact on this former seaport site as well. Was the northern extremity of the island selected for construction of Vajrayana inspired Mandala type of stupas away from the eyes of the orthodox Mahavihara because of opposition from this school which enjoyed the patronage at Anuradhapura and which may not have been in favour of deviating from Theravada traditions in concept and construction, except to admit some details such as dimensions of stupas and outer elaboration? How much the traditional school opposed any deviation in stupa construction could be judged from events in the time of King Mahasena including the events relating to the construction of Jatavanaramaya and later, the Dakkhina Thupa. It would seem that in place of galleries at Borobudur where stories taken from the life of Buddha and previous lives as Bodhisattvas founds in Mahayana texts were sculpted, in Sri Lanka, the large spread of later domes of stupas was used for mural presentation of such stories, only some remnants of which are found today. Perhaps, the nature of raw material available locally also contributed to the type of medium selected. In Boro-budur the volcanic rock was available in abundance which allowed the sculptors to use that medium for carving the galleries and constructing the stupas. In Sri Lanka no such material was available in abundance which may have been the cause for prefernce for bricks and plastering the surface to make it suitable for mural paintings. Kantarodai where the easily available raw material was lime stone [note the name Hunugama" Tamilised to Chunnakam] that was used in preference to bricks was an exception. The latter was not altogether unknown. They could have been transported from elsewhere. As Sir Paul E. Pieris saw there was enough to be carried away even in the 20th century for modern building work! These Kantarodai stupas could not have provided opportunities for mural work. Their concept of construction, and detail are entirely different except in basic form. Their small size need not lead one to conclude that they represent a very early phase of the development of the stupa or that they were intended for a lesser purpose. Kantarodai situated in isolation from the main centre of orthodox Buddhist activity in the island was also spatially better located to maintain contacts with centres of Vajrayana in India starting with Nagarjunakonda in Kalinga [Andhra country] and more so with South East Asia. One cannot also forget the possibility of the South Indian origin of the Sailendra rulers of central Java and Sumatra. Perhaps the era of Magha of Kalinga and Chandrabhanu, both from Malay archipelago, as Prof. S. Paranavitana thinks, [I am in agreement with it since there was no Kalinga kingdom in India in the 12/13th centuries but the concept of Kalinga was present in the Malay/Indonesian archipelago and still remembered] and their particular connection with the north of Sri Lanka represents a continuation of an earlier South East Asian link with that part of the island. In my view Magha was despised not because he was non-Buddhist, but because he professed a different kind of Buddhism. The fact that he had Buddhist texts of the kingdom torn from their strings and had the leaves scattered is a significant statement. The Hindu rulers are not known for destroying Buddhist sacred scriptures; though their followers, like a few Sinhalese kings short of funds to pay the armies had plundered and vandalised rich Buddhist temples. On the contary, those of the Mahayana persuasion showed no tolerance towards scriptures of the Hinayana school which they spoke of disparagingly. [The inferiority of the Sravakas as against Bodhisattvas]. This intolerance is still found among the Lamas towards southern Buddhism. The Avalokitesvara [Natha] temple at Chavakachcheri [Kokila sandesaya], which Holt assumed to be the work of Chandrabhanu may belong to an even earlier era of contacts with South-East Asia. Chandrabhanus connection with Mahayana [or Vajrayana] is not disputed. Even from Culavamsa we have evidence that on his second invasion he brought the Sinhalese in Padi [Padaviya] and Kurundi [Kutruntanaar or Tannimaruppu] under his influence before he marched to Subhagiri. This was the Mahayana triangle Pulmodai, Tiriyaya, Kuchchiveli area extending in wards - I spoke of earlier. There was already a Sinhalese [here meaning a South-East Asian Kalinga element] already in the Padaviya and Kurundan-aar area. If Gunadharma, the builder of Boro-budur, was a Sri Lankan monk well versed in Mahayanic/Vajrayanic lore as Dr. Voute surmises, one may even ask whether he proceeded to the Sailendra kingdom because there was no patronage but opposition to his concepts of construction. Kantarodai, as it presents itself to us today, is but a poor imitation of Boro-budur in scale, dimensions and detail. There is far more research that should go into the Kantarodai remains. It could, perhaps, reveal the missing link in Sri Lankas contribution to the traditions of Vajrayana school which the Mahavihara tried to hide; and, perhaps, unearth a South-East Asian phase in Sri Lanka History with closer South Indian and Bengali religious links, i.e., a Vajrayana phase of contribution to the evolution of forms of worship and monuments in Sri Lanka. This needs to be undertaken before the chapter is closed and the monuments could disappear altogether. I have done a close study of the monument and the images at Boro-budur but have not had the opportunity to see the remains at Kantarodai. This is not because my interest in Sri Lanka cultural remains is less; but because I was exposed more to the cultural heritage of Indonesia during my long sojourn overseas. The Indonesian monuments are better known as a result of the remarkable endeavour by the Indonesian government, albeit in a Muslim country, and the international community to protect, preserve and present the past Buddhist heritage. While I undertook writing of the present paper I realised how difficult it is to obtain even precise information on Kantarodai remains from Archaelogical Survey records. What Rt. Rev. Dulip Chickera, Bishop of Colombo said recently [The Island] after his visit to Buduruvagala and Yudaganawa that lesser known Buddhist remains in the island outside the Cultural Triangle need to be brought to the attention of the people and their true singnificance be explained, equally applies to the Buddhist cultural remains in the North and East. The late Major-General Anton Mutucoomaru, the first Sri Lankan Army Commander under whom I had the privilege and pleasure of working advised me repeatedly, after his many years of experience as a diplomat that he had found that the essential message that Sri Lanka could impart to the international community as the main thrust of her diplomacy was that of Buddhism with its emphasis on peace, non-violence [Ma-ghata: Dont kill] and other qualities, which the country had adopted as the main source of its culture. These were the words of a man of culture this country produced and of a non-Buddhist. Even if we do not think of the international community, do we not owe it to our people that they should be made better aware of their past culture and to jointly appreciate it whoever its creators were and despite their present affiliations? That is where Kantarodai and other remains matter.